One by one, volunteers of all ages spent the morning of Saturday, Nov. 13, adding school supplies, personal hygiene items, toys and even flip flops, to empty shoe boxes with one goal in mind – make children happy around the world. 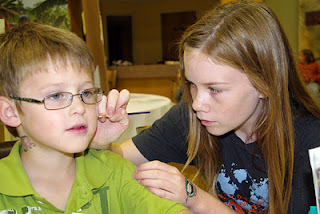 It was all part of the seventh annual Operation Christmas Child Community Shoebox party, hosted by First United Methodist Church – Siloam Springs, and organized by Lane McLoud and Billie Stone. Throughout the event, volunteers took part in 20 game or activity stations to “win” prizes, which could then be added to approximately 356 shoeboxes. McLoud said at least 150 of the boxes packed Saturday will be shipped with an “EZ Give” barcode (pre-paid shipping), which will let them find out where many of the gifts are delivered. 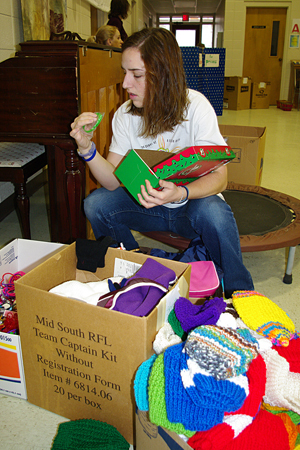 While much of the work was completed on Saturday, one volunteer, Sue Farley, spent several months knitting numerous, multi-colored hats, specifically for the party. Farley was already making plans to make more for next year. Members of the Girl Scout Troop No. 5082 were among the many volunteers taking part in the event. Zeriah Largent, 10, said she liked being part of the effort, because it was a way to show compassion for other kids. Other volunteers included members of two small groups from area churches, John Brown University students and numerous families. Boxes packed during Saturday’s event will be taken to Sager Creek Community Church, 1600 Cheri Whitlock in Siloam Springs - the local drop-off site for Operation Christmas Child. 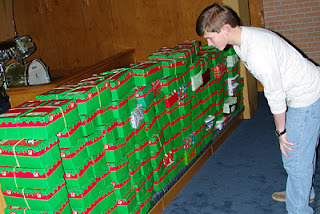 Additional shoeboxes filled this week can be taken to Sager Creek Community Church, from 4 to 6 p.m. now through Friday, 1 to 3 p.m. on Saturday, 1 to 3 p.m. Sunday, and 8 to 10 a.m. on Monday, Nov. 22. 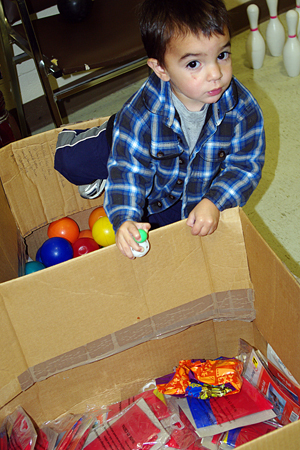 Wyatt Freeman, 1-1/2, picks out a ball for a shoebox party during the community shoebox party. He attended the event with his grandparents, Melody and Craig Taylor of Siloam Springs. Andrea Hair picks out a toy to put in her shoebox during the community shoebox party. This is the fourth year Hair, a senior at John Brown University, has participated in the annual event.